Some recent research I’ve been doing into an Anglo-Chinese family living in Sydney in the 1870s–1880s led me to both an interesting problem and an interesting discovery. I undertook this research for someone else, so I won’t mention any names here – lets just call our couple ‘J’ (the husband) and ‘R’ (the wife). The problem was thus: the copy of the couple’s marriage registration provided by NSW Registry of Births Deaths & Marriages includes a Chinese signature for ‘J’ the groom, but it is completely indecipherable. So indecipherable, in fact, that it is even difficult to make an educated guess as to what the name might be. 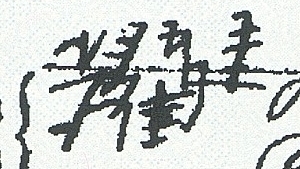 Finding a Chinese ancestor’s Chinese signature is one of those Eureka moments, so finding out that no one can make sense of it is rather disappointing. I began to wonder, therefore, if the original parish marriage register might provide some clues. All the information on the marriage registration is in the same handwriting, so I thought it might be possible that the details, including the ‘signatures’, had been written in by someone else (who could not write Chinese). This had been the case with another later marriage in the same family – by checking a copy of the original church register I was able to see the (English) signatures of the bride and groom and witnesses. Many early parish registers for Sydney and New South Wales have been microfilmed by the Society of Australian Genealogists – my local copies are in the National Library. Starting out with great hope, in the end I could not locate the appropriate register among the microfilms. This did, however, lead me to my interesting discovery. My couple, ‘J’ and ‘R’, were married in 1874 by the Rev. Dr James Fullerton LLD, a Presbyterian minister in Sydney during the middle decades of the 19th century. Fullerton was a somewhat controversial figure who was reputed to run a ‘marriage shop’ out of his home – many of his marriages were performed there rather than in his church. In 1851, he was tried in the Supreme Court for ‘illegal solemnization of marriage’. Fullerton was known not to ask too many questions, and on the registrations of marriages he officiated, the personal details are often scanty and incorrect. For my couple, only minimal details are given and the bride’s age has been stated as being 21 (the age of consent) – she was actually only 17. The original church registers maintained by Rev. James Fullerton up to 1873 are held by the Uniting Church Archives NSW/ACT, those from 1874 are held by the Presbyterian Church’s Ferguson Memorial Library in Surry Hills. Thanks to archivists at both those institutions, I now know that Fullerton’s original register can shine no more light on the Chinese name of my groom ‘J’. It just says that the groom signed ‘in Chinese’. Alas. A Chinaman from Canton, calling himself ‘Charles Tuckland,’ was charged with keeping a brothel. The case was proved for the Crown by a Pagan Chinaman from Canton, names Lau Hawk, who deposed that the house was a brothel, and that he had married his wife Ellen Jones (a young woman aged 19 years, and a native of Sydney) out of his, prisoner’s disorderly house. Lau Hawk’s marriage was celebrated by the Rev. Dr. Fullerton, on the 23rd of January last. The marriage certificate was produced in Court. The witness, Lau Hawk, was sworn, at his own request, by blowing out a match, “not being a Christian.” Law Hawk [sic] swore that Tuckland’s house was a Chinese house of ill-fame, mostly frequented by Chinaman, but that degraded white men sometimes went there. Constable Michael H. Fox also gave evidence as to the extremely disreputable character of the house. A night-watchman, named Brennan, likewise gave similar evidence. This man had been complained to about Tuckland’s house by the people in the neighbourhood. The witness had seen Chinese men and white women – mostly very young – in couples in every room in the house – all smoking opium. The women were white women, and one of them was the woman Ellen Jones or Ellen Hawk. The white prostitutes and the Chinamen used to make a practice of smoking opium together. Brennan had seen the men smoking opium there, and passing on their opium pipes to the young women in whose company they were. Joe Hong, a Chinaman, gave the like evidence. For the defence, Mrs. Hawk (wife of Lau Hawk), gave the prisoner’s house a good character. She said she was drunk with spirits (not opium) when she was married to Lau Hawk. She went with Lau Hawk to Dr. Fullerton’s, to be married to Lau Hawk on an evening at twenty minuted to 10 o’clock. She swore that she was not then married to Lau Hawk, because they were told ‘it was then too late,’ but she did get married to him at the same place on the following morning, and was drunk at the time. Lau Hawk swore that they were married at night. Mrs. Lau Hawk’s bridesmaid was a girl called Emma Jones; one who passes as her sister, and who was living with Ellen Jones at Tuckland’s, but was not related to her. His Honor, in the course of his remarks said that the circumstances of this case were most extraordinary, and would, he trusted, be reported by the Press. The prisoner’s defence was that his house was a ‘welly good house, and not bad at all.’ He sold opium for people to come and smoke it, and the young women waited on his customers. The jury, without retiring, returned a verdict of guilty. Sentence: To be imprisoned in Darlinghurst gaol and there kept to hard labour for six calendar months. The opium merchant fluently expressed his astonishment at the result of the trial in Chinese, and was promptly removed from the Court in the midst of his disagreeable surprise.